Rain lashed several parts of North Karnataka on Monday. Heavy rain, accompanied by gusty winds, lashed Hubballi-Dharwad on Monday afternoon, for more than half-an-hour. 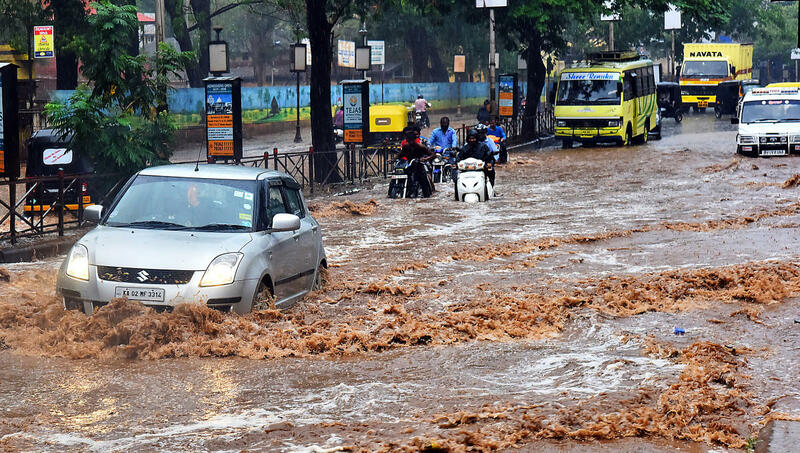 Pedestrians and bike riders rushed to shelter and rainwater was heavily flowing on the road at some places in Hubballi. Even four-wheeler drivers found it diffcult move on some road stretches which had become like streams. Mercury level came down and the rain has brought a relief as the harsh summer has already begun. Trees were uprooted and electric poles also fell at some places, damaging a few vehicles and disrupting power supply. Rainwater also entered into some houses at low-laying areas. The mood created by the rain in Hubballi and Dharwad was totally different. In Dharwad, the rain came after nearly 140-hour rescue operation at the site of the building which collapsed claiming 19 lives completed. In Hubballi, showers were at the end of Holi (Rangapanchami) celebrations which included playing with colours and Kamadahana. Meanwhile, Gangappa Chavargi (28) was killed when lightning struck him at Hugainkeri in Kalaghatgi taluk in Dharwad district. Ningappa Kowar, 36, was injured in the incident. Belagavi city and some parts of Belagavi district received unseasonal mild showers for about 30 minutes to one hour combined with hailstones and thunder providing much needed respite from scorching summer heat. Cloudy weather prevailed in Belagavi and surrounding since noon and in the early evening mild showers were received that brought down day time temperatures. Hirebagewadi and surrounding villages in Belagavi taluk, M K Hubli in Kittur taluk, Khanapur town and surroundings too received mild showers for about 30 minutes. Overcast conditions were witnessed at Ramdurg, Bailhongal, Gokak and Harugeri town in Raibag taluk, Savadatti and Raibag town. Rain also lashed Karwar, Sirsi, Haliyal, Dandeli and Yellapur taluks in Uttara Kannada district. Kalaburagi city, Chincholi and several parts of Shahabad taluk received rain accompanied by thunder, lightning and storm at night. Hanagal received drizzled in the evening.